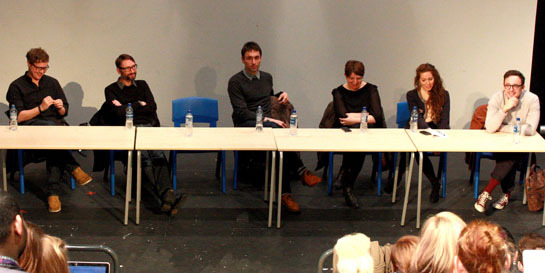 The team spoke to current students on the Institute’s BA (Hons) Music and BA (Hons) Music, Theatre and Entertainment Management programmes. Aaron, who graduated from the latter in 2007, talked about how he turned his lifelong passion for music into a career, and his experience at LIPA. “It’s such an open place to go to school. It was what I wanted to do and where I wanted to be,” commented Aaron, whose first job came out of a work placement. Aaron was joined by Mercury Records managing director Clive Cawley, Universal Music UK director of digital Paul Smernicki, creative consultant Niamh Byrne, commercial partnerships creative director Maria Murtagh, and Polydor’s director of A&R Ben Mortimer. After the members of the panel introduced themselves and talked about their backgrounds, the floor was opened for questions, which covered topics such as artist development and the signing process. The rapid growth of digital, from social media to online streaming, was also discussed. Paul explained that in the space of six years digital had grown from a backroom bolt-on activity to a core business function. The panel explained that the advent of the internet made it easier than ever for artists to get their music heard and that new acts starting out must promote themselves online. Click HERE to read more about Utalks.